Savaii is the ultimate destination for a relaxing, tropical island holiday. The clean white sand and sparkling blue lagoons are perfect for all the family, and provide the ideal setting to relax, recharge and leave the rest of the world behind. ​Afu aau Waterfall, Surf Coast. Falealupo Canopy Walkway, Sunset Coast. ​Saleaula Lava Fields, Sunshine Coast. ​Swimming with the Turtles, Sunshine Coast. ​Savaii's many lava tubes and caves — Paia Dwarves Cave, Letui Peapea Cave, Aopo Cave. ​Try some poke (raw fish) at the Savaiian Hotel's Lesaogaimiti Restaurant and enjoy spectacular views of the neighbouring islands. ​Catch the evening lale (drums and fire dancing) at Le Lagoto Resort & Spa, then treat yourself to a scrumptious local lobster. ​Order the twice cooked octopus at Amoa and appreciate the bluest, most beautiful lagoon in Samoa. ​Get in on some afakasi room action on the lava fields at Bayview Resort— half self-contained European room, half Samoan fale. ​Enjoy the spectacular hospitality and atmosphere at Vaimoana Seaside Lodge, including string band and cocktails galore. There are so many properties to visit and sites to explore — there is literally something for everyone! 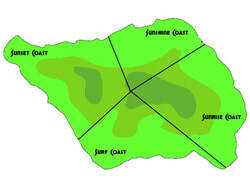 (Activities are divided into coasts as per the map below​).